There are a lot of ways that you can repurpose old t-shirts to make interesting new things. Here’s one example. The other day I raided my husband’s collection of ratty old t shirts. Choosing a red one, I put it on a table and cut the bottom hem off. Then I made a cut parallel to the bottom, from just below one armpit to just below the other. The part of the t shirt above that cut I saved for rags. 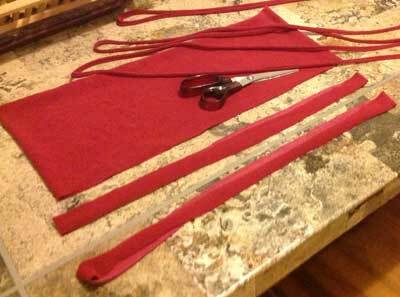 Then I began cutting strips about an inch wide, sometimes less — I didn’t measure. Then you stretch out each strip, pretty much as far as it wants to go. (The first t shirt I tried this with, a once-nice one of mine, didn’t stretch. But the four others I’ve done have worked fine. All of them have been seamless, which is nice but not absolutely essential.) 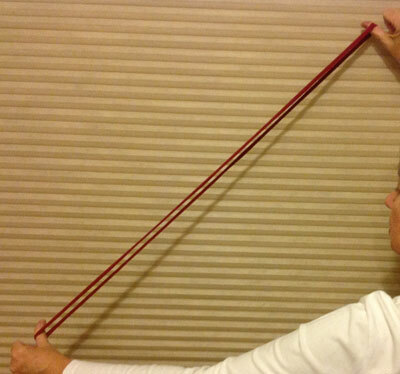 Once you’ve stretched it end to end, hold it in the middle and stretch again, to curl up the ends. And that’s really all there is to it! Do as many as you can get from that shirt, and play with different ways of wearing them. 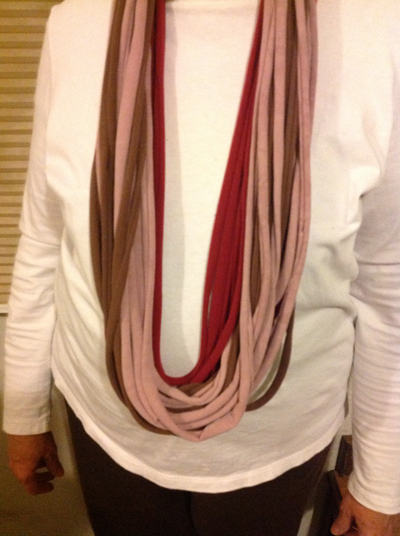 My old t-shirt scarf-necklaces are separate, so I can choose how many to wear and what colors, but often people combine and attach them. There are lots of ways to do this and all are easy and fun! 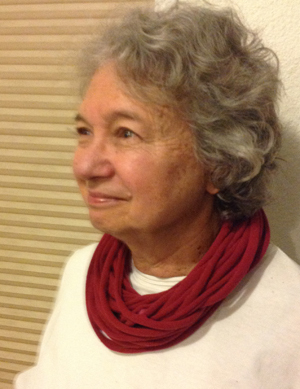 For a list of links to many, many ideas for repurposing t-shirts, see this great page. When I found it, I didn’t bother to do more research myself! She has links to some good books on Amazon, too. You could make a really cool matching bracelet, too!